On 10th April 1945 in the battle of Pyawbwe, Central Burma, No.8001 WS/Naik Budhbir Pun 1st Bn. 3rd Q.A.O. Gurkha Rifles was the leading section commander of a platoon, ordered to take a Pagoda situated on a steep hillock. The approach to the hillock was over deeply eroded ground which provided the enemy with excellent natural cover and made the advance of our troops most difficult and slow. The Japanese were in great strength, as was confirmed later in the day by the large number of enemy killed, and were well dug in in the deep honeycombed nullahs leading towards the Pagoda area. As soon as Naik Budhbir Pun's section left the start line his section came under heavy enemy automatic and small arms fire from the front and flanks. Undaunted Naik Budhbir led his section fearlessly on and maneuvered his men into the position covering a strong Japanese position from which an L.M.G. was pouring continuous and accurate fire on our own troops. Naik Budhbir then crawled forward alone over twenty yards of bullet swept ground and hurled a grenade into the enemy position from point blank range, silencing the gun and killing three Japanese. Budhbir pressed on his attack toward his objective until once more he was held up by heavy fire. Standing out in the open in full view of the enemy who now directed their fire entirely on him, he placed his section to cover the enemy position and dashed forward himself and threw a grenade into the enemy position and silenced it. By now Naik Budhbir's section was reduced from ten to six men but he once more led them forward to the foot of the Pagoda hillock and rallying his men under the accurate fire directed on them from above he led the charge up to the Pagoda itself. Hurling grenades in front of him as he went Naik Budhbir reached the Pagoda ahead of his men and killing three Japanese snipers in foxholes around it. The remainder of the enemy overcome by the fierceness of the attack fled down the far side of the hillock into the nullahs beyond. Naik Budhbir's section was now reduced to only three men, and had been in continuous action for over two hours. The platoon objective had been captured, almost entirely, due to the outstanding qualities of leadership and bravery of Naik Budhbir who throughout, had inspired his men by his utter disregard for danger and by his own determination and gallantry. In this hard fight Naik Budhbir's section had killed thirty Japanese, nine of whom were killed by Naik Budhbir himself. From his position on the hillock Naik Budhbir saw some sixty yards ahead of him an enemy Anti-Tank Gun, manned by 5 Japanese, firing on to the Road to his Right flank. Without further orders, and on his own initiative Naik Budhbir crying to his few remaining men to follow him charged down the hill on to the enemy gun position. Hurling grenades he killed three of the crew, the other two fled only to be killed by the rest of the section who had charged close behind him. Throughout the hand fought action for his platoon's objective and later in the capture of the enemy anti-tank gun, Naik Budhbir had continuously exposed himself to enemy fire and fearlessly led his section against heavy opposition, and had killed 12 Japanese out of thirty five his section killed that day. The leadership and determination of this magnificent N.C.O. was beyond all praise and his supreme bravery and utter disregard for danger, which was an inspiration to all who saw him, was worthy of the highest tradition of the Gurkha. During the attack on the strong point at SIDI ABDULLAH on 29 April 1943, the Company met intense opposition in the way of A/Tank Gun fire, machine guns and grenades from well constructed fortifications. Without hesitation L/Cpl. 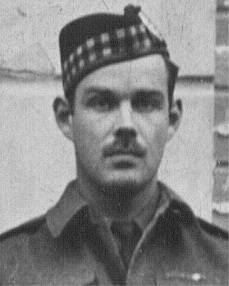 McQUOID dashed forward towards an enemy machine gun and first fired at the crew with his rifle, killing at least two men. He followed up this charge by standing on the parapet and lobbing a grenade down into the trench. He withdrew slightly and took another grenade from one of our injured men, then returned to the parapet and hurled it amongst the enemy. Immediately after this he was wounded by another grenade which was thrown at him from a nearby trench. L/Cpl. McQUOID's action silenced the Machine Gun, gave the Company a moment's respite which enabled it to recover and sweep along the right flank and get into a position from which we were able to drive out the enemy from the remaining trenches and later consolidate our position. In the opinion of his Company Commander it would have been almost impossible to achieve this had it not been for L/Cpl McQUOID's heroism, and many more men would certainly have lost their lives. V.C. Scored outD.C.M. Recommended & Awarded. Son of William Cowan McQuoid and Gladys McQuoid, of Balham, London. Recommended for a Victoria Cross and appears to be downgraded to a Distinguished Service Order but possibly no medal awarded. It appears he had already received a DSO and my DSO book lists him as only receiving one DSO in 1944 and a MiD in 1940. Appologies for any mistakes - The citation is hand written. For conspicious gallantry at Tebourba on 1st-2nd Dec 1942. This officer showed leadership, determination and gallantry of the highest order. His company bore the weight of two heavy enemy tank and infantry attacks and sustained very heavy casualties. Largely owing to the example and leadership of Captain Thomas, no ground was given up and heavy casualties were inflicted on the enemy. On two ocassions Captain Thomas remained in his slit trench whilst enemy tanks passed over him. He immediately proceeded to endeavour to put these tanks out of action with 75 grenades and four enemy tanks were destroyed in the area occupied by Captain Thomas's company. A very clear report from this officer enabled me to put in a counter-attack with my reserve company which caused over 70 casualties to the enemy and caused him to withdraw to Djeideida on the afternoon of 2nd December 1942. Captain Thomas maintained the highest fighting spirit in his company in desperate circumstances. Captain Thomas was severly wounded during the action. Recommended by Lt. Col. JM Lee, Late CO 2 Hamps. On a slight tangent, the disparity between the number of awards of VCs in the two world wars is shown clearly by the example of the Lancashire Fusiliers. In the Great War, the Regiment won no fewer than 17 VCs (arguably 18, but the last was won by an officer on attachment from the Irish Guards). In the Second World War there was only one-Fusilier Frank Jefferson at Monte Cassino. The LFs hardly had a quiet war, various battalions fighting in the 1940 European Campaign, North Africa, Italy, Burma (including one battalion attached to the Chindits) and Northwest Europe. During the First World War there were apparently mutterings that the LFs had 'friends in high places' when it came to confirming VC awards. Whats his name? I'll post the citation for you ? On 17 May 1944, 1 Canadian Infantry Brigade was ordered to advance from the PIGNATARO area to the high ground overlooking the FORME D'AQUINO. The 48th Highlanders of Canada moved on the axis of the road with their left flank on the LIRI RIVER. The Hastings and Prince Edward Regiment advanced on their right. "D" Company of the 48th Highlanders was leading the battalion, supported by a troop of Churchill tanks from "C" Squadron of 142 Regiment RAC. 16 and 17 Platoons of this company made contact with the enemy. This opposition was easily dealt with but in the skirmish the number 38 wireless sets with both platoons were knocked out and contact was lost with both the company commander and the tank troops commander. The two platoons however continued their advance. 16 Platoon commanded by Lieutenant Ballard moved on the right of the road and 17 Platoon on the left. As they approached the battalion objective 16 platoon was fired on at close quarters by 75 mm guns which were sited on the high ground. One man was killed and another was wounded. Lieutenant Ballard immediately organized an assault on the position, sending one section up to the right and himself leading a section forward on the left. Machine gun and rifle fire immediately broke out, and the commander of the right section was wounded, Lieutenant Ballard led his men against the 75mm gun positions. Hurling a grenade, he killed the crew of four men who were about to fire another round into his section, with another grenade he killed several members of a protective section of enemy infantry. He was no unarmed, and a German officer levelled a pistol at him, with a shout, Lieutenant Ballard charged and with his bare fists forced the German officer to drop his pistol and surrender. Altogether on this position, nine of the enemy were killed and twelve were taken prisoner. Also captured were three 75 mm guns, one half track vehicle and one machine gun. Lieutenant Ballard then consolidated his hard won position. The remainder of his company and "A" Company were thus able to take up positions on the objective. This ground they held against determined counter attacks by enemy tanks and infantry. In the meantime the other two companies of the 48th Highlanders had become involved in very heavy fighting with a strong enemy position on the high ground to the right of "D" Comany's axis of advance. By nightfall they had not succeeeded in dislodging the Germans. However, when the counter attack on the position taken by Lieutenant Ballard failed, the enemy on the feature also withdrew and 1 Canadian Infantry Brigade was quick to follow up and pursue. The heroic conduct of Lieutenant Ballard won the day for his battalion and had very far reaching results in the subsequently successful series of actions against the Adolph Hitler Line. Lt. Ballard was awarded the Distinguished Service Order. After the war he studied for the Ministry and became an Anglican Priest. At Awang Khangu on the evening of 12 July Captain Parkin commanding "A" Coy was detailed to carry out a raid during the night on the Japanese held village of Ningthoukhong Kha Khanou. The object of the raid was if possible to establish the Coy in the village and if this was successful another unit would move forward and take over before first light on 13 July 44. Soon after dusk Captain Parkin moved his Coy forward and in the fading light carried out the attack with two pls forward on the North of village. The company in its silent approach completely surprised the enemy. Their forward position was driven in and the enemy fell back in some disorder leaving behind one tank. In order to exploit this surprise Captain Parkin with great personal determination quickly followed the enemy up and continued to drive the enemy back as he advanced until the company had captured two-thirds of the village including a second tank captured intact. Captain Parkin now informed Bn Headquarters that he had reached his objective and requested that the troops to take over the ground already gained should come forward. In the meantime not content with what he had already achieved he continued to harry the enemy by means of offensive patrolling. Unfortunately a Japanese counter thrust in the area North of the village prevented the additional troops and the consolidation stores from reaching the company. In additional platoon which had been sent to deal with this counter thrust had themselves been cut off. The situation therefore in the early hours of the morning of 13 July was that two pls with Coy HQ were surrounded on three sides by the Japanese and the fourth side which looked onto open paddy was well covered by enemy automatic fire. The Japanese having recovered from their initial surprise now adopted offensive probing tactics against the Company. Captain Parkin whilst consolidating the company as best he could without any consolidation stores kept the enemy at a distance by counter offensive tactics. By this means he was able to keep Bn HQ informed of the situation outside of his perimeter and passed back valuable information of the locations of enemy strong points and tanks. By dawn on 13 July orders were given to the coy commander that he was to hold on to his position, if possible, but he was not to regard it as a 'last men, last round' defence. During the whole of the day the company was were largely pinned to the ground by accurate and sustained sniping accomplished by bursts of LMG fire. Counter sniping measures organized by Captain Parkin caused casualties amongst the enemy. Ammunition was limited, wounded could not be evacuated and it was apparent that at least 24 hours must elapse before they could obtain any food. Captain Parkin during the day moved from post to post without thought of his own safety reassuring the men with his cheerfulness and confidence so that at a time when situation on was extremely difficult the men's morale remained high. By 1630hrs it was apparent that the Japanese had reinforced their troops in the area. About this time the enemy launched an attack from three sides supported by heavy LMG and mortar fire. It became obvious that Capt Parkin's very small force of little more than two weak platoons would soon be overwhelmed. Mindful of his instructions Capt Parkin gave orders for the withdrawal of his force. The problem before him was an extremely difficult one. He had already sustained casualties, the enemy commanded his only line of withdrawal which was across bare and open paddy and his troops were tired and hungry. He gave orders for a succession of 'lay backs', and commenced to bring out the first platoon with their wounded. The steadiness of the withdrawal in face of intence LMG fire is an adequate tribute to the skill and determination emanated by Captain Parkin and conveyed by his coolness and courage to all ranks of his command. At this stage in the withdrawal Captain Parkin was wounded by a bullet in the shoulder and very soon after that he had his left arm shattered by a grenade. Both officers commanding the platoons had been killed and the company sergeant major wounded. Unable, owing to his shattered arm, to crawl, Captain Parkin, realizing there was nobody else who could take over had himself dragged on his back through the paddy, stopping every few minutes to give orders and to control the withdrawal, using his batman to convey his instructions. This continued until sufficient cover had been reached for the party to lie up. His personal courage, bravery and tenacity of purpose which was of the highest order throughout, reached its climax during the withdrawal. In spite of intense pain his devotion to duty would not allow him to consider his personal feelings. His unselfish example was an inspiration to the men, both wounded and unwounded, under his command, and that the party eventually was brought back safely to the remainder of the Battalion can be attributed directly to the grit and determination of their commander. On the Halewood Village War Memorial near Liverpool is the name of George Ashplant. George was a pilot in 166 Sqdn R.A.F. he was awarded a C.G.M Aircrew which was awarded instead of the V.C. One of only 111 Awarded i believe. I personally think a VC was optimistic. The act was not in the face of the enemy which is a pre requisite. From my reading, his actions were those of someone who had exceeded the gallantry afforded an AFM & the CGM was probably the right choice. If there were ever 2 VC's that were not awarded, they should have gone to Pte's Hardy & Jones of the 7th Garrision Bn AIF for the Cowra breakout. It was a quirk of geopgraphy that got'em as western New South Wales was not an operational theatre. Had a good look through this thread & some great stuff mentioned. I don't think there is any sure or quick response to why they got what they got. Maybe quota came into play, th pre eminence of the act, were all the boxes ticked supporting the application? I do know that they set the bar a lot higher for WW2 than in WW1, partly because of the promulgation different awards that came into play during ww1. We had a similar thread running on BMF, but nobody could definatively say. sure looks like there were a few close misses though. Both recommended for VC , both awarded IOM.